OFGS | What Does OFGS Mean? OFGS means "Oh, For God's Sake!". 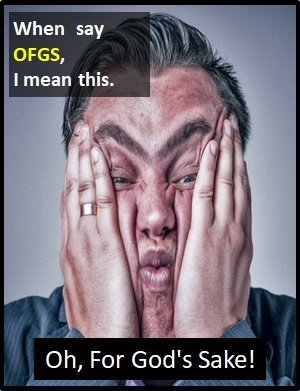 The abbreviation OFGS is used to express surprise, irritation or frustration. It is often used to add emphasis to a request or question. OFGS is very similar in meaning to the abbreviations FGS (For God's Sake), FCS (For Christ's Sake) and FHS (For Heaven's Sake). Care should be taken when using any of these abbreviations, as some Christians will find the use of religious terms in this context offensive. "Oh, For God's Sake!" was a catchphrase of Dr. Frasier Crane, the lead character in the sitcom "Frasier", broadcast on NBC from 1993 to 2004. Definition: Oh, For God's Sake! OFGS expresses exasperation or annoyance. Linda: I forgot to buy the wine. Carol: OFGS! You only had one job to do! Joe: Can I borrow your soccer boots? Steve: OFGS! You wear them more than I do! As it is pronounced using its individual letters (i.e., "Oh Eff Gee Ess"), OFGS is classified as an initialism abbreviation. Initialisms are different to acronyms, which are spoken like words. You were meant to be back yesterday! Before the digital era, we might have just said "Oh, For God's Sake" instead of using the abbreviation OFGS.